Compelling reasons to do business in Chowan County and North Carolina. North Carolina consistently ranks as one of the top places in the nation to live and do business. The state offers low business costs, supportive business environment, a large and productive labor force, and outstanding scenic and recreational attractions. A wide range of resources exist to start, locate, or expand a business in the state. It is important to remember that North Carolina’s corporate income tax rate is 3%. Electricity rates for industrial, commercial and residential are below the national average. In addition, there are grants and low-interest loans available to business owners along with an extensive array of tax credit incentives to new and expanding industry. North Carolina lies within a 700-mile radius of 170 million U.S. and Canadian customers and, at least, 70% of the nation’s industrial base. It is a “right-to-work” state with a unionization rate of 2.9%-the third lowest rate in the nation and workers compensation and unemployment insurance rates are among the lowest in the nation. Top this off with the fact that the community college system in NC offers free customized skills training to businesses and industry. Governor Pat McCrory presents Hal Burns, manager of Jimbo’s Jumbos, a commemorative flag. 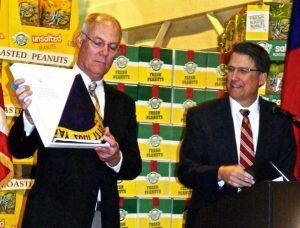 NC Governor Pat McCrory, joined by Hal Burns of Jimbo’s Jumbos, announced a major plant expansion at the company’s Edenton site on March 9, 2015. Jimbo’s Jumbos, clearly one of Edenton’s leading industries, will build a 280,000 sq. ft. facility to complement its existing operations on Peanut Drive. As a result, it will add 78 new jobs to a workforce that is presently over 200 strong. Governor McCrory offered his support of the project by authorizing a One North Carolina Grant in the amount of $156,000 for the company. The Edenton Chowan Partnership made a gift of land to the company. The 8.88 acre lot is adjacent to their present facility and is valued at more than $82,000. This land is critical to the success of the company’s expansion plans because it provides the additional space needed for the new building. Construction on the new facility will start this spring. The Partnership was also involved by facilitating cooperation and collaboration between the Town of Edenton and Chowan County to assure that the company’s needs would be met as it launches this major expansion. This is a role frequently played by the Partnership as local companies expand and new companies locate to Edenton. Jimbo’s Jumbo’s $30,000,000 investment will be further enabled by a $560,000 grant from the NC Department of Commerce to the Town of Edenton to install new water and sewer lines to the plant. The Town of Edenton and Chowan County will award economic development grants related to the number of new jobs created by the project. Agriculture is one of the largest industries in Chowan County. Although peanuts, cotton, and sage are the primary crops, some farmers also grow cattle and a variety of vegetables including some of the best tasting watermelons and cantaloupes. Strategically located in the heart of the peanut belt, there are two peanut processing plants, Jimbo’s Jumbos and Olam. Jimbo’s Jumbos has production and shelling operations in Edenton. Aside from preparing peanuts a variety of ways, Jimbos also works with other related food industries preparing peanut butter and granulated peanuts that are used in a variety of confections and pastries. Olam is the only peanut processor present in each of the world’s major peanut producing and exporting origins, which together account for close to 90% of global trade. Olam has a peanut processing facility in Edenton. Chowan County is also home to international exporting and waterway shipping. BCH Trading Company facilitates international trade in wood commodities. As stated on their web site: They “provide Southern Yellow Pine and North American Hardwoods to markets worldwide since 1998. BCH has built lasting relationships with mills and visits them regularly to ensure product quality. We continuously work with mill personnel so they understand the quality and presentation that is needed to meet our customer’s needs. In addition, we travel to meet with our customers to better understand their needs, end use of the product, and changes in their market. New products are often developed as a result of these visits.” Reach them at 252-482-0100. Steven Towing Co. engages in inland, coastwise, and ocean Towing and as noted on their web site, “is a midsize freight transportation company based on Yonges Island, South Carolina just south of Charleston, with a Mid-Atlantic operation based in Edenton, North Carolina. Stevens Towing Company was founded in 1913 on Yonges Island and originally engaged in moving produce and passengers from local barrier islands to the Charleston market. Colony Tire knows that all shipping rides on tires. From passenger vehicles to the giants of the road or field, Colony is there. With a large retread factory in Edenton as well as retail sales, Colony is a significant employer and local community supporter. They have jobs to fill as a result of several plant expansions. From their website: “Colony Tire was founded in 1976 in Rodanthe, NC, with just two gasoline pumps. Over the next few years, the company purchased two small oil companies in Edenton and Roper, NC and became a Farm Bureau tire dealer. Today, Colony is a multi-million dollar business and one of the leading tire distributors and automotive service providers in North America. With over 30 locations, this premier auto care and tire company serves vehicle owners throughout NC and VA…. MTD’s Tire Dealer of the Year Charlie Creighton and his wife, Susan, have been married for 42 years. The year was 1976 and Charlie Creighton was on a roll. Creighton, then 32, was working in the forestry equipment industry, selling machines for one of North Carolina’s leading Caterpillar dealerships. He already had established himself as one of the firm’s top salesmen with a knack for closing huge deals, including a $21 million order from a single customer. Selling tires had never crossed his mind. Thirty-one years later, Charlie Creighton is the CEO of Colony Tire Corp., one of the country’s largest regional dealerships with 40 locations throughout North Carolina and Virginia and 2006 revenue in excess of $100 million. He also is Modern Tire Dealer magazine’s 2007 Tire Dealer of the Year. How Creighton went from a forestry equipment salesman to one of the most successful and widely respected tire dealers in North America is a testament to his work ethic, his uncanny ability to seize opportunities that others have missed, and a quiet, understated confidence. Southern Ag Carriers, Inc. complements the region’s food industries. SouthernAG understands the connection between harvesting and delivering. Whether your transportation needs require van, refrigerated or flatbed trailers – SouthernAG has the resources to meet your needs. To insure quality and safe handling of food, the company has earn two certifications testifying to the quality of their work–SQF & HACCP. Chowan County has a diverse array of manufacturers including home construction products, boat builders, food products, fencing, and others. 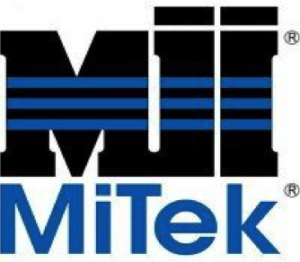 Companies like MiTek, a member of the Berkshire Hathaway family, have made their home in Edenton and are thriving in this rural context. They utilize the barge system on the Albemarle Sound to transport steel into the plant and trucking to move product around the Country. Centrally located in the Middle Atlantic States, Edenton is strategically positioned to move products north, south and west as market demands shift with changing times. The manufacturers in the County have found the area to be business-friendly with a great labor pool made up of dedicated workers. The State of North Carolina has also provided an extensive program of incentives that reduce the cost of doing business. This coupled with reasonably priced property and property taxes and a recent reduction in the North Carolina corporate tax rate to 3%, probably the lowest in the country, make Chowan County a great place to do business. Chowan County is home to some of the leading boat builders in the nation. Names like Regulator Marine and Albemarle Boats are known throughout the world as producing some of the finest boats on the water. Regulator Marine, builds some of the finest offshore sport fishing boats in the country. Regulators are North Carolina bred and born, tested against the challenging conditions of the Outer Banks and delivered to locations throughout the U.S. and abroad. Regulator is a multi-year recipient of the NMMA’s prestigious and highly coveted CSI award, which represents the highest level of owner satisfaction. Together these fine companies have enhanced the brand of Edenton and Chowan County as one of the finest boat building areas in the USA. Both the skilled labor force and the support services are in place to complement the needs of those manufactures in this industry. 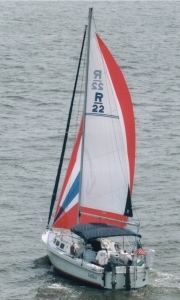 General Boats, globally known for their Rhodes 22 sailboat, has this to say deep in their web site: “Only a handful of New Rhodes are built each year (in this economy we are building mostly recycled Rhodes). So, when boat manufacturing is measured by nose count, we lose. When our industry is measured by performance, the Rhodes is always in the money. And when the purchase of a Rhodes is measured by quality, You win by a lot more than a nose. For those who want to go beyond Madison Avenue’ boat sales hoopla, here are hard nosed details of Rhodes’ construction facts that support its competitive surface puffery…. The Rudder Blade Control system. The Pop Top Arms system. The Cockpit Boarding Grab Rails. Source: NC Commerce, Labor and Economic Analysis Division, Top 25 Employers by NC County. County is determined by the address provided by the business. Murray L. Nixon Fishery Inc.
C.A. Perry & Son Transit Inc.